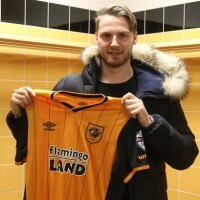 Nick Powell has explained his decision to leave Manchester United to join Hull City on loan until the end of the season was motivated by personal reasons. The midfielder was a deadline day exit as he joined the Championship side, his third loan spell in as many seasons, and he’s unlikely to return to Old Trafford, given his deal expires in the summer. “Bits and bobs. Mainly, it was personal reasons,” Powell said when asked if he had discussed the possibility to leave United with Van Gaal. “I wanted to get more game-time. I haven’t played in a long time, I’ve been injured quite a lot, hopefully that’s past me and I’m striving to get more games and play football again. Signed by Sir Alex Ferguson in the summer of 2012 for £4.5m, the 21-year-old scored on his Premier League debut against Wigan before impressing against Chelsea in a League Cup fixture in the same season but has since seen his career derailed by a catalogue of injuries. His only appearance last season came as United were thrashed 4-0 by MK Dons in the Capital One Cup, although in the current campaign he was surprisingly brought on as a sub as United chased a result away at Wolfsburg in the last game of the Champions League group stage. Powell, who also came on as a sub against Bournemouth a couple of days later, added he was excited by the prospect of linking up with former United defender Steve Bruce. “I talked to the gaffer, the ambitions are good, so I’m glad to be a part of that and get some games,” he said. “He just said to me I’ll play games, the lads are good, the atmosphere is good, pushing for promotion, it’s what I want to be, top of any league so it was a win-win.